The Duke of Edinburgh has been involved in a car crash while driving near the Queen's Sandringham estate, Buckingham Palace has said. Prince Philip, 97, was not injured in the accident, which happened shortly before 15:00 GMT. Probably disgruntled after he herd the factory's moving to Slovakia! He wouldn't have had his day turned topsy turvey if he'd been driving a Mercedes Benz. At 97, it’s probably a good time to hang up his driving gloves, at least on public roads where the public drive. Without attempting to prejudge a 97 year old driver having a road accident but just how would you prosecute Phil the Greek. Does he have Royal Immunity or would it go to court? Should it go to court then he will be prosecuted by the Crown, i.e. his wife. As the prosecution will be acting on behalf of the Crown his wife will affectively be presenting evidence against him. From what I remember about English Law a spouse cannot be compelled to give evidence against their partner. Last edited by Fareastdriver; 18th Jan 2019 at 08:50. Reason: Apparently what I was told in 1947 was wrong. Not quite right. It rolled after he pulled out, of a side road or driveway, into the path of a passing car, allegedly . I thought it was "Phil the Greek"*.... (amongst many other things, the Windsor family have fine form)... however, as you likely well know, it's who you know (in the UK) and you don't get much higher in the pecking order, so probably zilch. *I have been lambasted on these forums for calling him this in the past... nice to state it yet once again! 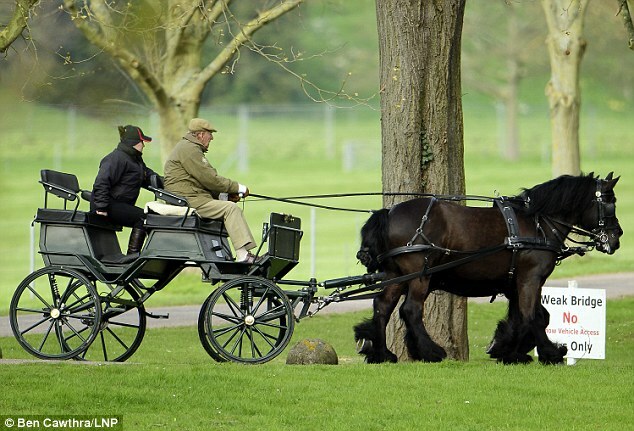 He may have got confused and thought he was driving one of those things above, with only one horse pulling it along and didn`t have that bloke sitting on the back seat. This has caused excitement for those who have an ongoing agenda against older drivers. Of course a car pulling out is likely to be in the wrong, although that depends how fast the driver was going on the main road. It could be a case of a 97 year old cautiously pulling out and a 17 yeard old driving like a bat out of hell The offence here if HRH is in the wrong would be the 'catch all' of driving without due care and attention. Of course any other 97 old driver would be routinely breathalised, given a mouth swab for drugs, eyesight test and have his mobile phone checked. One other point, having recently been a passenger with an 93 year old lady, like his bodyguard, I saw myself as an extra pair of eyes. One royal commentator stated that HRH continued to fly as a pilot to 55, when the retirement age is 48 (if only), in the absence of the fact that Ray Hanna was still displaying a Spitfire at 77. Last edited by anchorhold; 17th Jan 2019 at 21:42. The Archbishop of York, John Sentamu, tweeted a prayer in support to the duke, and later another one for the two other people involved in the accident. from the BBC. So that's all right then - God reads Twitter? Nice of him to remember the other people involved as an afterthought, which the statement from Buck House did not - certainly as reported on ITV. Well in good conspiracy theory fashion...it's got brexit off the front pages. Nope. I remember back in the 50s he was up before the beak (probably figuratively) for speeding offences on more than one occasion. And almost every driver I have seen. The problem is they keep looking left as they pull out when the immediate threat is from the right. You often need your head on a swivel with LRL and finally Right. I understand the other vehicle was the strangely and in this case appropriately-named ΚIΛ (= KIL in our alphabet). I'm sure if the Land Rover continued to roll back into its wheels HRH would have continued on his merry way and we would not have heard a word of it. I reckon the next Landy model won't be as boxy.